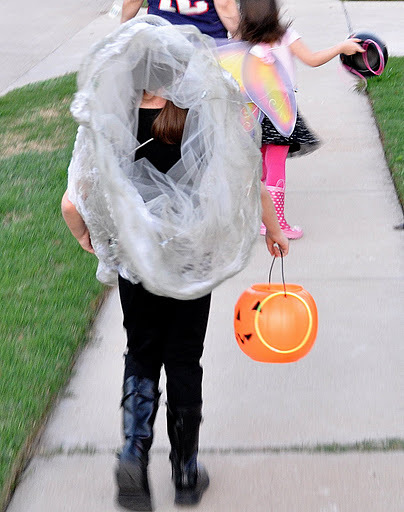 First of all, I missed trick-or-treating with my five and seven-year old stepdaughters. Believe me, I missed a LOT! They have the greatest neighborhood for trick-or-treating. 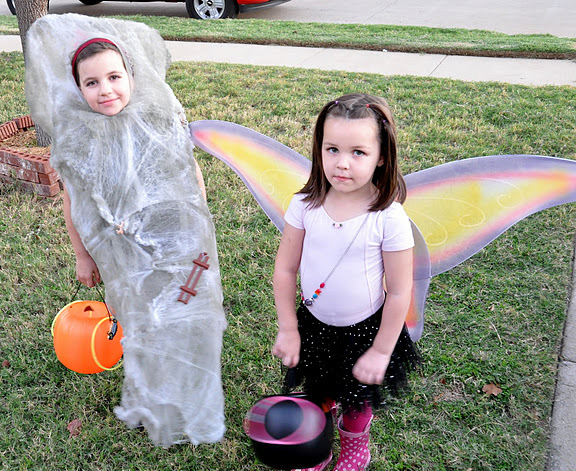 Lots, and lots of little kids (and parents), all dressed up – super cute. Everyone heads out at the same time, walking the four or five streets in big masses. If you are my age, it’s just like the neighborhood in the movie, E.T. Phone home! Phone home! It’s really awesome and incredibly fun. As far as I can tell, he used SHUTTER mode. I don’t even use Shutter mode. I can’t for the life of me imagine how S is confused with AUTO on the dial, but I digress….. Here are the photos from the night – taken by sweet husband – who is normally very good with my camera (in AUTO mode). VERY GOOD. Thank-you honey for taking the camera. Please pardon the blurry ones. These are way too good to miss, heh! Can you guess what step daughter number one is? If you guessed, F3 tornado from Oklahoma? You would be correct! Or maybe she is just a tornado, but let an Okie girl have her fun, mkay? 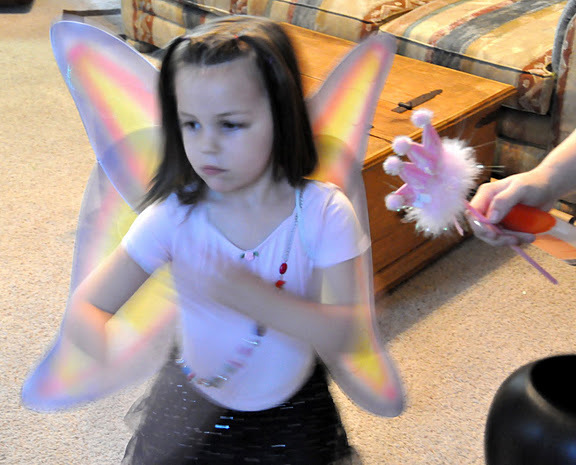 Step daughter number two is a bug weather fairy. I think….. I mean she has rain boots on (and lord knows we need lots of that!). I adore her pretty wings! 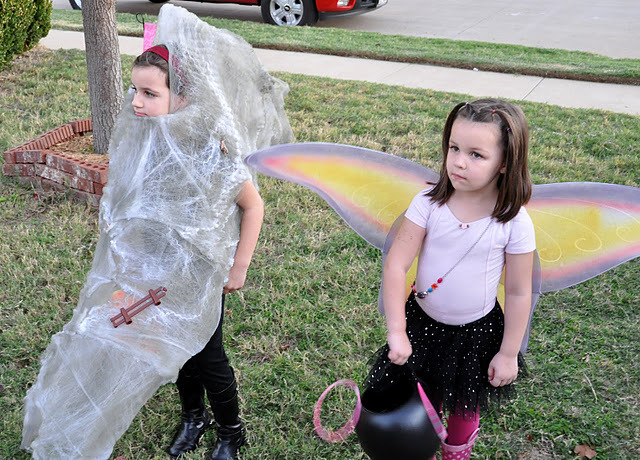 They traipsed around the neighborhood (or swirled, or flew, or blasted?). I’m surprised no one was taking cover in the closet! She totally should have carried a siren with her. 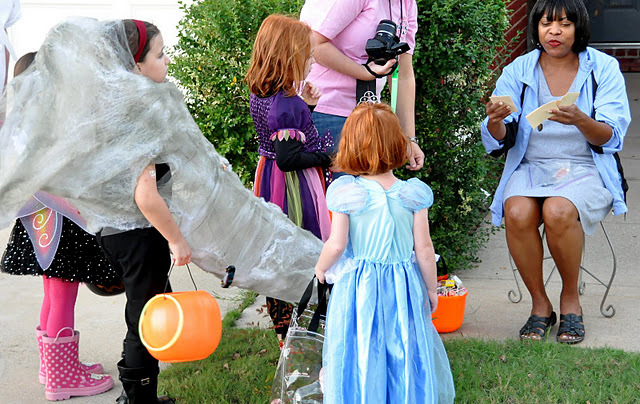 This is my favorite part of the Halloween documentation photos and where I get to say….Jason is storm chasing! HA. I crack myself up! Look out! A tornado is heading for a house and some kids! Take cover! Ahhhh! Give me some candy or you’ll end up on the other side of town. WHOOSH!!! Here we have, funnel cloud in motion, not to be confused with funnel cake. Totally different, but I’m hungry, so I could confuse? Look out little fairy! You are going to blow away! WHOOOSH!! I have to give props to their mom for a very UNIQUE costume this year. She makes them by hand (seriously…wow!) every year. 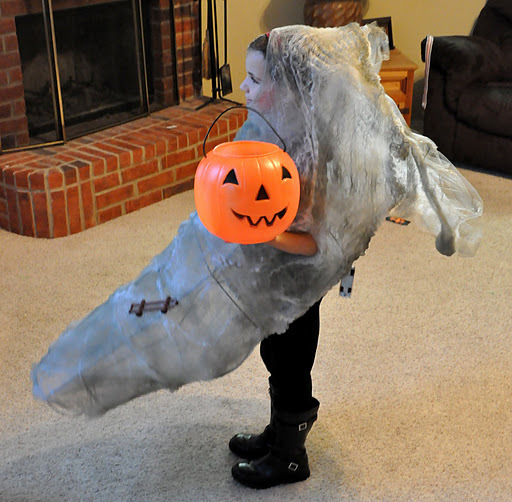 I don’t think I have ever seen a tornado costume before, especially one as cute as her. Where is a contest when you need one? And for the best news of all, the weather fairy said we should have more rain and cooler temps soon. Yay! This (I swear!) is my last Halloween post, but I saved the best for last, right? AWESOME! 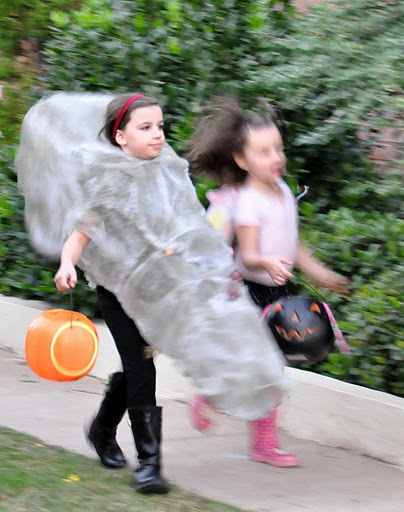 Did she buy the tornado costume or make it? Is someone complaining about Halloween posts? I enjoy all your posts so more Halloween is fine, no more is fine, whatever! I hope that you enjoyed your class. And Jason might have used a different setting than you wanted, but at least he took the lens cap off! Something is better than nothing! XOXO! Look how that little fence got caught in the storm. Haha! I was going to guess cocoon. Such great costume ideas! Thanks for sharing, Happy WW! How cute are they? Their mom has more patience (not to mention talent) than I ever did when my daughter was younger. LOL Very creative! I think your hubs did a pretty good job considering the camera wasn’t on the right setting. How can you go wrong with such sweet subjects to photograph anyway, right? Thanks for stopping by and leaving such a lovely comment! Hope to see you around often! Absolutely beautiful little girls! I like your Rangers background. I’m actually a lifelong St. Louis Cardinals fan. I fell in love with a few of the Rangers during the World Series – as well as with Coach Washington. They all play the game the way it’s supposed to be played and I’ve got nothing but respect for all of them. The fans were great too! If every tornado was that cute, more people would drive toward them. Adorbs. come on, the hubby did good, he did take photos, right? the Tornado, wow that is original! Yes, you did save the best for last!! LOVE the commentary!!!! LOVE the tornado. How creative and unique! Super cute and creative costumes. So great of hubby to capture these for you so you could experience the fun too. Love the costumes! Love the cars hanging… I mean caught in the tornado. It looks like they had a great time.